Central Nepal is dominated by the Annapurna Himal and the village of Pokhara. There are three major trekking routes in central Nepal: to Jomsom, to Annapurna Sanctuary, and a circuit of the Annapurna Himal itself. Pokhara is also a good starting place for short treks of one to four days, including the "Royal" trek, which is described here. Mustang is also geographically a part of the Annapurna region, but because treks to Mustang are subject to special restrictions, this is described it in the separate page on restricted area treks. About two-thirds of the trekkers in Nepal visit the Annapurna region. The area is easily accessible, hotels in the hills are plentiful, and treks here offer good scenery of both high mountains and lowland villages. ACAP was established in 1986 under the guidance of the King Mahendra Trust for Nature Conservation. The project encompasses the entire Annapurna range, more than 7600 sq km. In an innovative approach to environmental protection, it was declared a "conservation area" instead of a national park. A large number of people live within the protected region, but traditional national park practices dictate that few, if any, people reside within park boundaries. In an effort to avoid any conflicts of interest, ACAP has sought the involvement of local people and has emphasized environmental education. ACAP projects include the training of lodge owners, with an emphasis on sanitation, deforestation and cultural pride. They have trained trekking lodge operators and encouraged hoteliers to charge a fair price for food and accommodation. ACAP encourages the use of kerosene for cooking throughout the region, and requires its use above Chhomrong in the Annapurna Sanctuary and on the route between Ghandruk and Ghorapani. ACAP is supported by a "conservation fee" of Rs 650 that is collected from all trekkers who obtain trekking permits for the Annapurna region. ACAP has encouraged the construction of toilets throughout the area; use them no matter how disgusting they are. ACAP has also made provision for the supply of kerosene in those parts of the conservation area where the use of firewood by both trekking groups and hotels is prohibited. In Pokhara, visit ACAP's Trekkers Information & Environmental Centre next to the Hotel Lakeside. In addition to providing information, the centre sells iodine, solar battery chargers and other products that can help you to protect the environment while you are trekking. There is also a "trekkers meeting board" and a battery drop-off centre. The route to Annapurna Sanctuary (Annapurna Deuthali in Nepali), the site of the Annapurna south face base camp, is a spectacular short trek. Though it has some steep climbs, the trek is not difficult. The major problem with this trek is that it can become impassable because of snow and avalanches in winter and early spring. It is the only major trekking route in Nepal that has significant avalanche danger, so you must inquire locally whether the trail is safe. Some trekkers have died because of avalanches, and others have been stranded in the sanctuary for days. The sanctuary trek traverses a variety of terrain, from lowland villages and rice terraces to glaciers, and offers outstanding high mountain views. This trek is a fine opportunity to surround yourself with Himalayan peaks in a short time, without having to contend with the altitude and flight problems of the Everest region. This trek travels around the entire Annapurna massif, visiting the Tibet-like country on the northern slopes of the Himalaya and the dramatic Kali Gandaki Gorge. Much of the trek is through lowland country, but there is one high pass, Thorung La. The pass is not difficult, but this is still a long trek at high elevation. You should be aware that you might have to return to Dumre if it is impossible or dangerous to cross Thorung La because of snow or altitude sickness. There are years when the weather allows it to stay open, but Thorung La is usually snowbound and closed from mid-December to mid-April. 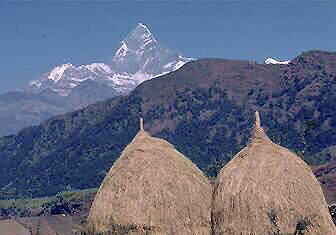 This is an easy, short trek that starts near Pokhara and offers good mountain views. It gained its name because Prince Charles and an entourage of 90 guests, camp followers and staff trekked here. The trek has also seen the likes of such luminaries as Mick Jagger. The route is not a popular one, so you will see few other trekkers. Contents copyright © 1995, 1998, trekinfo.com. All rights reserved.